It’s the 1920s. You’re wandering through an Eastern-European countryside, crops growing at angles in the still-fresh craters from the Great War. You stop to pat a lowing cow when, suddenly, the ground shakes with the thump of a massive footstep. Your nostrils prickle with the unmistakable smell of fuel. From behind a row of trees a towering mechanical beast crashes forward, its machine gun still warm from the heat of battle. You return to your harvest. Scythe takes place in… Oh, you know what? 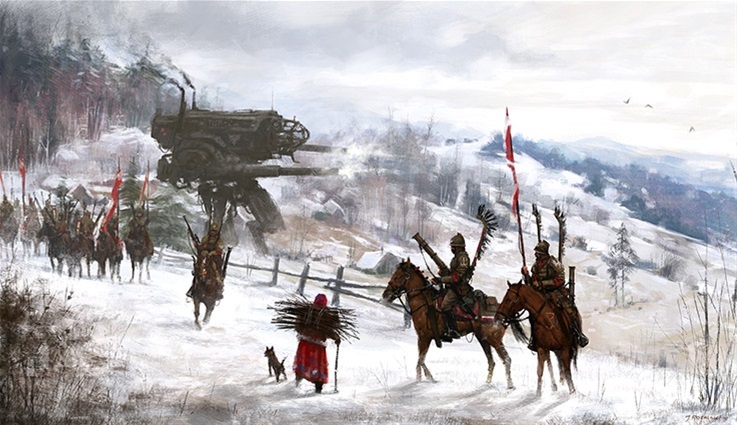 We’ll leave it to Stegmaier to explain why there are mechs stomping around post-World War I cornfields. “In an alternate-history 1920s Eastern Europe, adventurers from five nations converge upon an area of land surrounding a mysterious factory to exploit the plentiful resources, build their empire, endear themselves in the eyes of the people, encounter unpredictable situations, enhance their economy and conquer and control territory,” he summarises. 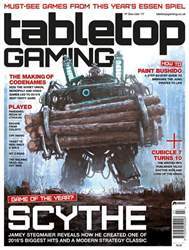 That’s right: as well as giving rise to tank and aerial warfare, in Scythe’s universe the First World War also sparked the creation of gigantic killer robots by a mysterious and powerful city-state known as ‘The Factory’.